As consumers, we are often reminded that we should get copies of our credit reports. However, sending away for them is kind of like flossing - you know it's good for you, but it's easy to put off. A new study should shock everybody into sending away for those reports right away. The study found that almost 80 percent of credit reports contain mistakes. Banks, insurance companies and even employers increasingly are turning to credit reports to determine what kind of rates you should pay and if you should be hired for a job. Ray Martin offers this advice on what mistakes were most commonly found, gives more details on the use of reports by employers, and tells consumers who find mistakes on reports what to do. 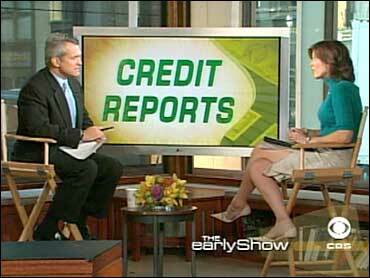 Several studies over the past 15 years have documented mistakes in credit reports. However, this newest study, conducted by the National Association of State Public Interest Research Groups, is the most alarming yet. It discovered that 79 percent of all credit reports contain some type of error - and 25 percent contain such serious errors that those individuals could be denied credit. 54 percent contained inaccurate personal information such as misspelled names, wrong Social Security numbers, inaccurate birth dates, inaccurate information about a spouse and out of date address. For example, one credit report listed a man's business partner as his spouse. 30 percent listed "closed" accounts as "open." For example, listing a student loan that was paid off years ago as still outstanding. Another report listed several credit cards, a mortgage and an auto loan all as open. 22 percent of reports had the same mortgage or loan listed twice. This mistake often occurs when loans are serviced or sold. 8 percent of reports simply didn't list major credit, loan, mortgage or other accounts that could be used to demonstrate the creditworthiness of a consumer. These errors can create the appearance of a consumer having "too much" credit available, being over-extended, or not having been a responsible payer of his or her obligations. The "big three" credit report bureaus - Equifax, Experian and TransUnion - have been in this business for years, so how can they possibly be making all of these mistakes? Most mistakes can be pinned to your creditors and others providing info to the credit bureaus. As mentioned above, some mistakes happen when credit accounts change hands. Some errors are intentional. The report found that some banks admit to not furnishing bureaus with complete information on customers. Other mistakes are simply human error. According to a credit bureau industry spokesman, some 30,000 data processors file 4.5 billion updates to credit reports each month, leaving considerable room for errors. These errors on credit reports can cause consumers serious trouble. Many consumers probably don't realize just how serious. It's no secret that banks use your credit report to determine interest rates on loans. The better your report, the better rate you receive. More insurance companies examine credit reports to determine what rates you should pay on auto and homeowners insurance. According to the Insurance Information Institute, companies have found that people with poor credit reports tend to file more claims. Thus, it makes sense to charge these folks more for insurance, the companies say. This view is being challenged in some states. Perhaps the most surprising use of credit reports is by potential employers. In recent months, newspapers have published stories about people not getting jobs after employers examined their credit reports. About 35 percent of companies report using credit reports in pre-employment screening. This number is larger - about 40 percent - among retailers. According to credit bureaus, the other industries that appear the most interested in credit histories include defense chemical, pharmaceutical and financial services. Why are more companies doing this? "Past employers, for fear of lawsuits, are more reluctant to provide substantive past employment information about an applicant at another employer," Martin said. Add to this the fact that reports are now relatively cheap and easy to obtain, and you can see why more companies are going this route. However, federal law does state that a potential employer must obtain your permission before pulling your credit history. Consumers should obtain a copy of their credit report from each credit bureau every year. Expect to pay about $9 apiece for your reports. Here's some good news: a federal law will soon require credit bureaus to provide consumers with a free copy of their report on an annual basis. You will still have to contact the bureaus yourself. The law even establishes one central phone number you can call to request all three reports. This law is being rolled out across the country over the course of a few months. It takes effect on the West Coast in December, and will eventually reach the East Coast by September 2005. If you find an error on your report, write a letter or e-mail to the credit bureau. The bureau is obligated to contact the creditor who supplied them with the disputed information and then respond to you within 30 days. If you are unhappy with how the claim is settled you can ask to have a brief written explanation added to the bottom of your credit repot.